Get pregnant sooner by identifying your fertile days with Baby 4 You ovulation tests, the result gives you 99% accuracy in less than 10 minutes. Specially designed to be the easiest pregnancy test to use, it gives 99% accurate results in just 3 minutes. Trying to get pregnant but your efforts don't seem to get you anywhere? Some women get pregnant easily but others find it difficult. 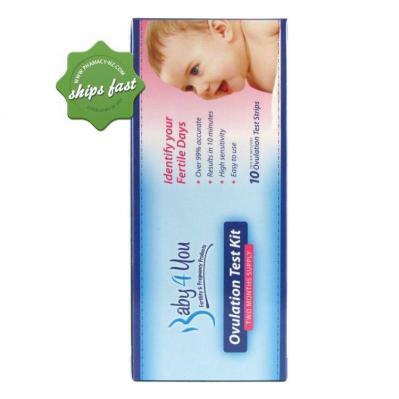 If you are eager to conceive you can find out when your most fertile days are with Baby 4 You Ovulation Predictor Test Kit. It is an easy to use tool that will let you know when are your fertile days so you can make sure you are trying at the right times. Get fast results in less than 10 minutes with high accuracy. 10 x individually foil packet strip style ovulation tests. 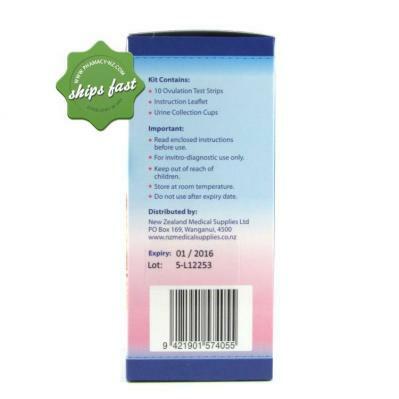 Remove the ovulation predictor test strip from the sealed pouch by tearing along the notch. Hold the test strip by the green handle. Dip the strip into your urine sample with the arrows pointing downwards. Do not immerse past the thick black marker line. Take the strip out after 5 seconds and lay the strip on a clean, dry and non absorbent surface. Depending on the concentration of LH in the urine, positive results may be observed in as little as 1 minute. However, to confirm negative results, the complete reaction time of 10 minutes is required. Do not read results obtained after 10 minutes. To get full instructions and how to read the results correctly, please click on the link.